Put link here please – review still to be published. 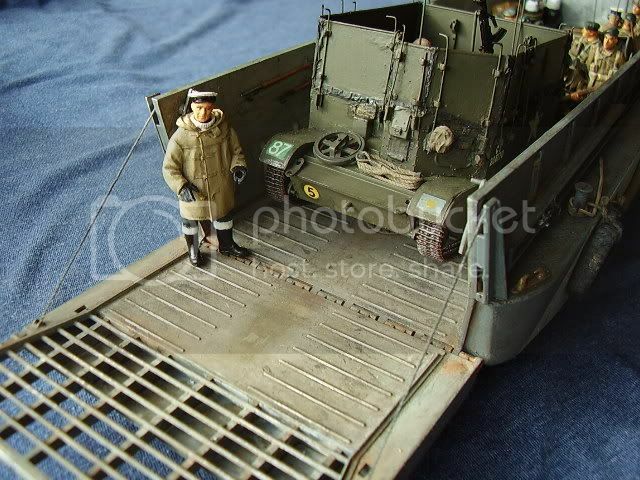 This time a figure specifically for the wheel house of the Landing Craft Mechanised Mk III or LCM 3 if you prefer. This figure should be useable in either the current Italeri or Trumpeter kits. Wee Friends figures come in a clear snap plastic box with at colour insert depicting the figure. The insert also shows the Company Name and product reference number. The figure is contained with in a further zip plastic bag within the box. Also included is a small leaflet showing the contact address, and phone number for the company. This leaflet contains an additional safety warning regarding working with resin. (Not included in my example). Cast in a light cream resin, the figure comes in 4 parts, the body being cast as a whole is dressed in sea boots, trousers, a typical RN jumper covered with a Duffel coat. You get a head wearing World War 2 Mark II helmet steel helmet. The arms are cast onto the body and hands, wearing gloves come as separate items. The casting on the body is excellent, nice folds in the duffel with the button detail present on the front and cuffs and the coat hood is well represented. His trousers are tucked into his sea boots over which are folded a pair of socks. The polo neck of the jumper is shown beneath the duffel coat and this too is well depicted. The Head is well cast, with good detail, showing the face of a mature man and around the face he is wearing a good representation of protective flash head gear. The hands come covered with a pair of gloves and are designed to hold the wheel of the boat. The figure should paint up very well indeed and give a good RN commander figure for the boat. Another very useful Royal Navy figure from the Wee Friends range. Good proportions and good detail mean this should be a desirable figure for both model boat builders and figure painters alike. I would like to have seen the inclusion of an Officers or Petty Officers head and cap to give greater flexibility in use and perhaps give the feel of an old sea dog. Personally I have been delighted to see the arrival of both this and the other Royal Navy figures on to the market, and having communicated with Ian at Friendship Models I am greatly encouraged that there as several more RN figures planned. A change of head and this figure cold also be utilised as a crewman. I don’t know if the duffle coat was used by other navies but, if so again a change of headdress is all that would be required which would make the figures even more flexible. Highs: Well cast with good detail and will grace and add to any LCM that he is placed in. He may well appeal to stand alone figure painters also. Our Thanks to Friendship Models!